Making my way through the past three weeks here in beautiful Florence has been a dream and stumbling upon some really cool places has made my experience even better. 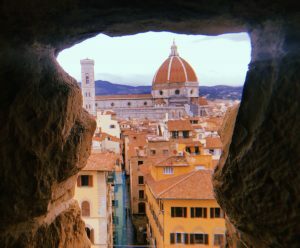 In hope that your experience studying abroad is amazing, here are my top four must-see and must-eat at places and spots around the city of Firenze. 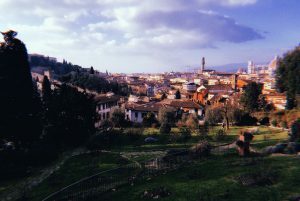 Number one would have to be this secret rose garden that is located halfway up the steps to Piazzale Michelangelo. It is two sets of steps and to the left. This little rose garden is currently not in bloom but the atmosphere is very peaceful and quiet. As you stroll down the slanted hill, you can discover a little secret Japanese Zen Garden with a wooden bench perfect for basking in the warm sun and journaling. Taking some time to walk around the garden and explore what it has to offer is the best part. All the little details in the garden is what really makes it special. Number two would have to be the longest line you’ll ever wait in this time of year in Firenze besides museum day and that is All’ Antico Vinaio. This is a multiple award- winning panino shop that has two shops directly across from each other just so they can accommodate the amount of people that come their daily. 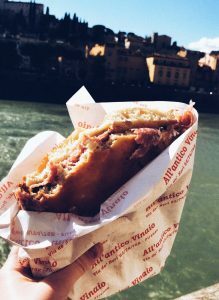 This panini is the best thing you will ever put in your mouth while you are here in Florence. The best part is the panini is so big that you can save some and eat it a couple hours later to have it be just as good. They have so many delicious combos and for 5 euro it is a great deal. My personal favorite is the “Favolodra” or the “Boss” and taking it to go sit by the river wall near the Ponte Vecchio is the best. I highly recommend grabbing some friends around noon and waiting in line at its shortest line of the day and then making a B line to the river which is a brief walk. This is the perfect midday lunch break from classes and can really make your day that much better. Number three would have to be a visit to the Palazzo Vecchio. This museum has been my favorite so far for it is a city museum that is filled with art commissioned by the Medici family. These works cover every room from wall to wall including the ceiling! Your neck will hurt after your visit here since every new room is filled with art at every single angle. It is so breathtaking to see the scale of these paintings and this museum has one of the largest grand halls in Europe. The works of art include sculptures from Michelangelo, paintings of oil on wood, oil on canvas and gold leave religious depictions. It is truly a place to see and the tower is the best part. I highly recommend climbing the tower to at least the first level where you can see a view of the city like no other. Definitely pay the extra 10 euros it costs to go up and take a look around a 360 degree angle of the entire city. Be prepared: it is cold and windy this time of year so bring a warm coat! Also, if you want to visit this museum, you can for free on certain holidays so be sure to look out for those days coming up! Number four is the sweetest. It is gelato from La Carraia. Maybe you have heard of this place from Facebook, when it went viral a few weeks ago for it’s 1 euro cone. This gelateria has homemade gelato in a variety of delicious flavors including their home flavor, which is vanilla and pistachio with real pistachios. If you ever need a pick-me-up, definitely stop in the shop that is right around the corner from the main FUA buildings on Corso dei Tintori. 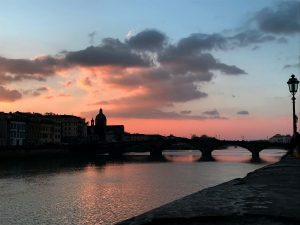 Overall, there are so many places I could point out as the best spot or place to eat, but it is always better if you yourself stumbles upon something that beautiful Florence has to offer. It is truly a remarkable city and getting lost and exploring a new part of it is the best way to discover something awesome. Lauren is a spring 2018 SAI Florence student from Emmanuel College.